View over Wark Castle and village, Carham. Copyright Tim Gates, 2003. The parish of Carham, which also includes the village of Wark-on-Tweed, is located on the English side of the Scottish-English border. It is this border location which has defined the archaeology of the area, from battles and skirmishes of the 11th century through to regular border conflict throughout medieval times. However, long before Scotland and England were defined as nations, people lived and died in this area. So, what archaeology might we find there? The earliest archaeology in the parish dates to the Bronze Age. A number of burial sites dating to this time have been found at Howburn to the south of Wark and another possible grave site near Wark. In addition to these burials a decorated bronze axe was found near Cornhill in 1945 and a dagger from Carham, discovered in 1853. A number of settlements dating to the Iron Age can also be found in the Carham area. Many of these settlements are located on hilltops and a few are still visible as earthworks. Examples can be found at East Moneylaws Camp, Castle Hill Camp, Downham Camp and Mindrum Mill Farm. There is evidence that the Romans passed through this area, with a number of temporary Roman camps including Mindrum, East Learmouth and Carham. A large number of Roman coins in a pot were also found on Camp Hill which may have been a settlement. The nature of the sites suggests a Roman presence in the area, but the camps lack any sense of permanency. Perhaps the Romans passed through when on the march rather than settling here? It was after this time that the start of border skirmishes and battles can be seen in the archaeological record. Battlefield sites are difficult to locate accurately and there is rarely anything to see on the ground. The Battle of Carham in 1016 was fought between Malcolm, King of the Scots and Eadulf Cudel, the Anglo-Saxon governor of Bernicia. Battle Place marks the site of a battle from 1340 where the Scots defeated the English. The site of the battle of Piperdean, fought in either 1435 or 1536, can also be found in the parish. Because of the strategic importance of the area on the Scottish-English border, a castle was built at Wark. Wark Castle was built and destroyed many times and survives as a grassy mound in the village of Wark today. Close to Wark Castle, the remains of a medieval chapel can still be seen in the ground. Another chapel once existed at Pressen, but nothing survives of this 12th century building. In addition to small chapels, the area could also boast an Augustinian Abbey founded in 1131. 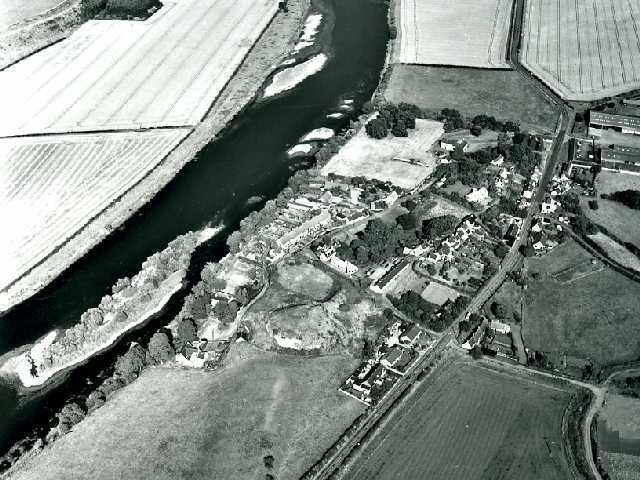 Nothing can be seen of his abbey today, but it is thought to have been located west of the Church of St Cuthbert in Carham. The area around Carham once had a number of villages which have since been abandoned or replaced by single farms. Such deserted medieval villages can be seen at Learmouth, where raiders almost destroyed the village, Mindrum, Downham and Moneylaws. Carham Hall started as a 13th century tower and was later expanded to become a 19th century country house. Documentary sources tell us that in 1550 a tower was to be built in the area as a defence against raiders, however we do not know whether it was ever built or whether it might refer to a tower that still survives. As times became more peaceful, the area was able to thrive and take advantage of its fertile land. A number of attractive farm buildings were constructed at West Learmouth, along with houses for farm labourers. The coming of the railways to the area in the 19th century has left its mark too, with a viaduct at West Learmouth. Mindrum railway station was designed by William Bell and stopped carrying passengers in 1930. Nearby, Hagg Crossing is a house built for the keeper of the railway crossing. Sunilaws Railway Station was constructed in the 1840s.